Diesel Particulate Filter Regeneration: When, Where And Why? What Does A Muffler Really Do? 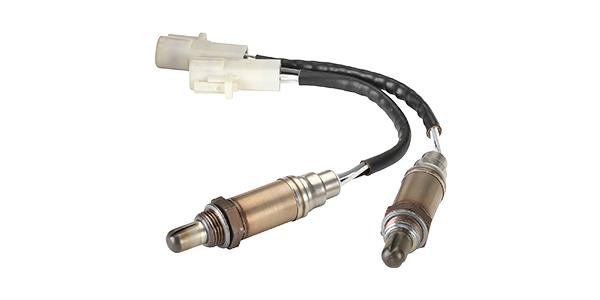 Wideband air/fuel oxygen sensors may appear similar to conventional narrowband oxygen sensors, but there are quite a few differences that you need to be aware of to service vehicles with this new style sensor. Conventional O2 sensors have been a mainstay in the automotive industry for several decades, going back to 1976 when Bosch first introduced them on Volvo 240/260 models. A narrowband sensor works on a rich/lean principle. When the air/fuel mixture is on the rich side, the voltage output is around 0.8 to 0.9 volts, and when the air/fuel mixture is lean, voltage drops to 0.3 volts or less. However, a wideband A/F sensor gradually changes the current signal as it correlates to the air/fuel ratio and reads higher voltage for stoichiometric — typically 3.3v. Wideband sensors were developed to more accurately measure A/F ratios over a broader range of operating conditions (hence the name). A narrowband sensor can measure only between approximately 14.0/15.0:1 air/fuel ratios to report a rich or lean condition, but a wideband is much more robust. Honda was the first to use a wideband O2 sensor in its 1992 Civic models. The manufacturer calls its wideband sensor a lean air-fuel (LAF) sensor, which is used to read AFR as rich as 12:1 to as lean as 22:1. The LAF sensor confused many technicians at first because it looked similar to a traditional O2 sensor, except that it had five wires. These sensors are referred to by several names such as lambda sensors, AFR, LAF and wideband O2 sensor. A wideband sensor can detect oxygen content in the exhaust that’s way below or way above the ideal air/fuel ratio of 14.7:1. More control of new lean-burning engines that emit ultra-low emissions is necessary today. Even though some EPA regulations have been relaxed recently, demands for better fuel economy are still pushing the development of sensors that will better control the AFR in today’s lean fuel engines. 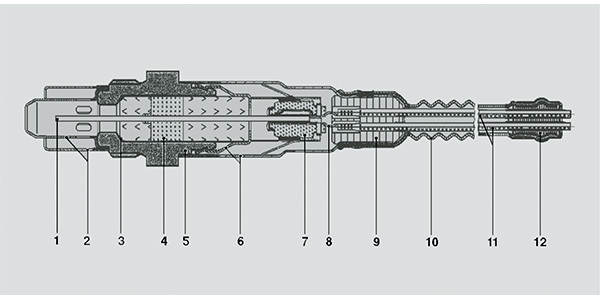 There are two types of wideband oxygen sensor designs: dual-cell and single-cell. A single-cell O2 sensor looks similar to a narrowband 4-wire sensor, but they can be either a planar design or cup-style. The four wires designate two for the heater and two for the signal and operate at 0.4 volts for the sensor. However, the PCM supplies a low current to control the signal between positive and negative volts, which is stoichiometric AFR, and the baseline for rich or lean conditions. Dual-cell AFR sensors use a planar design with a flat­zirconia dioxide element that’s about 1.5mm thick. The planar design has several advantages over a single-cell AFR sensor due to its quicker warmup times, faster switching times and better resistance to contamination. 1. Sensor Element (combination of Nernst concentration cell and oxygen-pump cell); 2. Double Protective Tube; 3. Seal Ring; 4. Seal Packing; 5. Sensor Housing; 6. Protective Sleeve; 7. Contact Holder; 8. Contact Clip; 9. PTFE Sleeve; 10. PTFE-Shaped Sleeve; 11. Five Connecting Leads; and 12. Seal. One of the main reasons manufacturers are going to wideband AFR sensors is because the heater channel comes up to operating temperature quicker — as fast as 10 seconds, in some cases. However, wideband sensors also need to be heated to higher operating temperatures to function effectively. While a narrowband sensor operates in the 600° F range, a wideband sensor needs to be heated to 1,200-1,400° F. The fast heating helps reduce emissions during cold starts and allows for improved fuel efficiency because the engine spends less time operating in open-loop mode. Some hybrids use the electrical circuit when the vehicle is in EV mode to heat the AFR sensors before the engine is called to duty, allowing 100 percent closed-loop operation. A quality scan tool can be used to test a wideband sensor, but be aware that many aftermarket scan tools display AFR sensor data in conventional sensor voltages or some other data stream such as lambda or milliamperes, which can be confusing even for an experienced tech. Depending on the model, some AFR sensors use pulse modulation, in which case, an amp probe or scope is better for testing amperage or current flow. The mechanical and electrical construction of today’s AFR sensors has become more complex and application-specific. Be sure to look at what the manufacturer uses for data output on a specific model before testing, or you’ll be scratching your head for a while.